The beauty and durability of hardwood floors often lures home owners into replacing old carpet flooring. They replace it with something that is far more durable and better looking than carpet. This can be a great investment which will improve the value of your home as well as make it much easier to sell. Most buyers are looking for homes that do not have carpet in them. Consumers who have allergies also want hardwood floors and no rugs at all to avoid and reduce their reaction to dust etc. If you are looking into hardwood floor installation for your home there are a few things you will need to know, even if you plan to hire someone to do the work for you. This article features some tips and directions to ensure your hardwood floor installation goes smoothly. 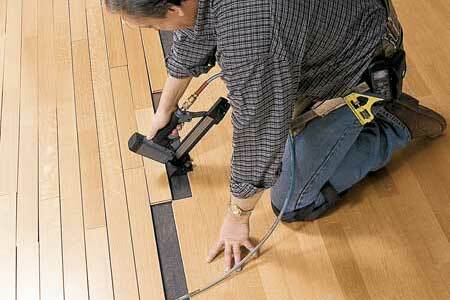 Planning is an essential step in the hardwood floor installation process. A little organization goes a long way. First of all, all wood including hardwood flooring needs some adjustment time before you can install them. Storing the wood indoors for a few days in your home will allow the wood to expand and will give you time to prepare the area were the hard wood flooring will be installed. Make sure you have all the necessary tools including a hardwood floor nailer, miter saw and jamb saw before you get started. Some consumers will purchase this equipment, while others will simply rent it for the time they need it. Be sure that the sub-floor is properly cleaned and level. This is the time to make sure that the sub floor is well nailed to the joists. Some people will add a second sub floor on top while others will screw nail the sub floor to the joists to avoid any squeaks in the floor later after the hardwood is installed. You can also cover the sub-floor with asphalt felt. On the felt you may want to make a few helpful markings that will really help you out later. At the starting wall you should mark a straight line about a half inch from the wall. Also, a chalk center line should be made by making a few measurements at various points in the room. When you begin the hardwood floor installation, choose the longest boards or widest planks. You then should pre-drill some pilot holes in a place where the 1 ½ inch finishing nails will be hidden when the molding is replaced and face nail the first boards into the floor joists. For the following row you should drill pilot holes at 45 degree angles into the tongue every 10 inches. Also, nail at the floor joists and the ends of the board. Use the floor nailer for the following rows until there is no more room and finish the room in the same manner it began by hand. Hardwood floor installation requires some carpentry skills, however with some planning and the right tools it should go smoothly. Seeing the finished product is satisfying and will be rewarding for many years. Take your time and if you feel that it is not going well, stop, take a breather and consult an expert. Personally when I am doing work of this sort, I know it is time to stop and take a breather when I get tired or I get frustrated. This is when mistakes are made which only makes the situation worse. Stop for the day, go for a walk, whatever you need to do to relax a bit and gain a new perspective. This way you will have that perfect floor that everyone wants. I also like to work in a steady manner whenever I am doing work of this sort. I make less mistakes and I get more done. In fact no matter if someone doesn’t understand then its up to other users that they will assist, so here it happens. My floors are in, but now i have to install hardwood flooring on the stairs. This is going to take a lot of work since my stairs are curved and each piece must be cut differently and custom fitted. would like to see a post about installing hardwood flooring on stairways.